Seven-year-old Diamond, a poor stableboy, receives a visit from the beautiful dark-eyed woman known as North Wind. 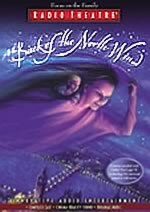 Their adventures in the land at "the back" of the North Wind teach him — and us — eternal truths about life, love and forgiveness. Set in Victorian England, George MacDonald’s classic novel will stir your heart and spirit. Fully dramatized with sensational sound design, specially composed musical score and a host of Britains leading actors, including Juliet Stevenson and Joss Ackland. In Victorian London, the sickly son of a poor cab driver is suddenly carried away on an enchanting adventure by an unlikely companion: The North Wind. Over the London rooftops, across the sea and to the back of beyond, the boy encounters great wonders and profound mysteries. But is it merely his fevered imagination or are there secrets in this world we have yet to discover? As with his other stories, George MacDonald focused on other-worldly themes when he wrote At the Back of the North Wind. He was always seeking --as C.S. Lewis would later attempt in his stories about Narnia -- to open the minds of his readers to the possibility of other worlds and of other kinds of reality. As Colin Duiez asserts, At the Back of the North Wind is a story of two worlds: "It vividly portrays the ’real’ world of Victorian London, but into it, MacDonald shows the other real world that we do not normally see, constantly flowing into it, bringing out the real meaning of everyday events, people and things." Enter a story where hope is introduced, fear is cast away and replaced by peace, and illness is shed...At the Back of the North Wind.